Facilitate more efficient development and delivery of CCi’s documentation and training materials through content re-use and single-source, multichannel publishing. Enhance users’ experience by making it easier to navigate the online Help and locate the information they need. Lower the cost and effort associated with translating CCi’s documentation into 14 languages. Efficiency: Flare’s topic-based single-source publishing facilitates content reuse and streamlines delivery of documentation in HTML5, PDP, EPUB, PowerPoint, and Adobe® Illustrator® outputs. Intuitive Experience: HTML5 Help in Flare with Google-style search provides employees a clean, modern web experience when accessing the information they need. Customization: Snippets, variables, and conditional tags in Flare enable CCi to customize content for different clients with minimal effort in ways previously not possible. Cost-Effective Translation: MadCap Lingo, which is fully integrated with Flare, eliminates redundancies in translating CCi’s documentation into 14 languages, saving time and money. Competitive Capabilities International (CCi) is at the forefront in delivering solutions for global operations excellence management. Serving organizations across more than 70 countries, CCi’s solutions drive sustainable bottom-line results for clients by building world-class capabilities and best practices across the entire value chain. At the heart of these solutions is CCi’s cloud-based software platform, TRACC, which powers the business improvement initiatives of some of the world’s leading organizations. To help clients take full advantage of TRACC in improving their operations, CCi delivers a range of documentation and instructional materials. Today, the company relies on MadCap Flare for single-source publishing of this content across multiple formats, including HTML5-based Help, PDFs, EPUB files, and Microsoft® PowerPoint® slides. Additionally, CCi uses the translation capabilities of MadCap Lingo to cost-effectively produce content in 14 different languages. For years, CCi relied on a combination of products to produce its PDF documentation and training materials. Content was first developed in Microsoft® Word. Then, the Word content was manually imported into Adobe® InDesign® to create layouts for the different outputs that CCi was delivering. However, it was both time-consuming and labor-intensive to manually make edits and ensure consistency across CCi’s extensive documentation, including some 12,000 pages of content in PDF and EPUB formats and 10,000-plus PowerPoint® slides (these figures are for the English content only). “Additionally, we had to produce translated versions of our Adobe® Illustrator® illustrations and info-graphics that we use throughout our various outputs, which was quite expensive,” said Richard Cooksey, IT consultant at Inceptus Technology Corporation. As a result, the CCi content development team began to search for a tool that would enable the company to improve efficiency, reduce time to delivery, cut costs, and allow rapid tailoring of content to the needs of individual customers. After an evaluation of authoring tools on the market, MadCap Flare emerged as the clear choice, providing a method for single-source publishing that would increase automation and customization. “With advanced features, such as topic-based authoring, conditional filtering and multiple output formats, MadCap Flare seemed like the answer to help CCi meet all their requirements,” explained Cooksey. Taking advantage of MadCap Flare’s Microsoft® Word import capabilities, CCi was able to import all of its existing documents and convert them into Flare–an enormous feat considering the amount of content that needed to be migrated. 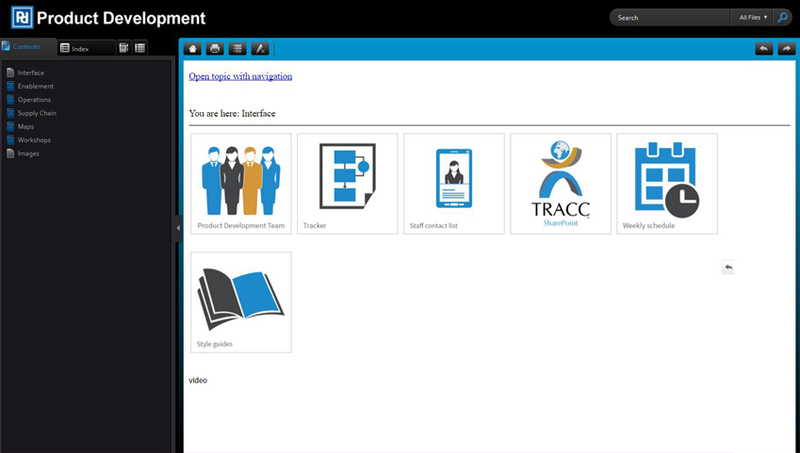 Today CCi delivers EPUB and PDF documentation, as well as PowerPoint®-based training materials for its TRACC Platform software system. Additionally, the company provides an internal HTML5-based Help system for employees to help them search through the published content. By taking advantage of MadCap Flare’s topic-based single-source publishing capabilities, the CCi team has been able to streamline the process of creating and publishing this content. In the past, multiple people and processes were required just to update content for all the different outputs. Now using MadCap Flare, the content development team can update the content once within a single Flare project, and then use conditional tags to mark the content they want extracted and published to the bespoke TRACC Platform software. CCi has gained further efficiencies and fostered collaboration by leveraging MadCap Flare’s ability to integrate with the Git version control system (VCS) and MadCap Contributor, which is fully integrated with Flare. Meanwhile, to ensure content quality, the team relies on MadCap Analyzer, which is fully integrated with MadCap Flare. MadCap Analyzer goes through CCi’s Flare-based documentation to find issues, such as inconsistent code and broken hyperlinks, and provide recommendations for addressing them. “Analyzer has been super helpful in enabling us to manage our content and find critical issues quickly,” Miller says. The translation memory functionality in MadCap Lingo allows us to see what we’ve translated as we work for future reuse, eliminating unnecessary repeated translations. CCi also takes advantage of the tight integration between MadCap Flare and MadCap Lingo computer-aided translation (CAT) tool and workflow management solution to deliver its documentation in 14 languages. The ability to have straight-forward management of PowerPoint and Illustrator-sourced content in, along with our other Word-sourced Flare content is quite powerful and innovative. Beyond the efficiencies CCi has realized, the company relies on MadCap Flare to enhance the experiences of employees and clients, alike. For employees, the writers use MadCap Flare’s HTML5 output to deliver a more intuitive, modern internal Help system. 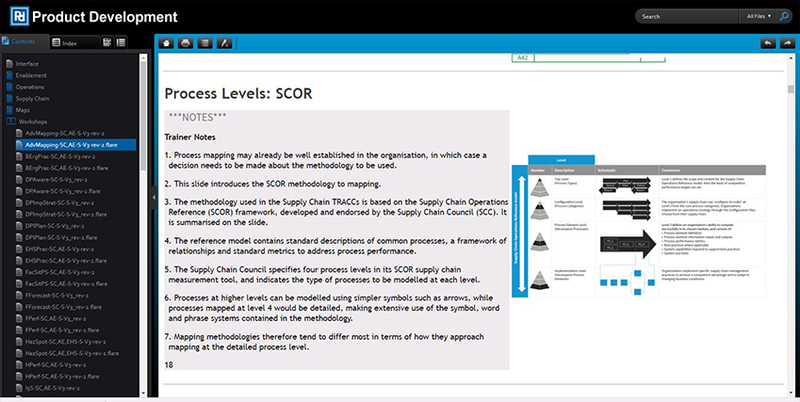 “Flare’s HTML5 output provides a sleek web look and feel, and has also enabled CCi to give employees an easy-to-navigate knowledge base,” Cooksey explained. The team also takes advantage of Flare’s Google-style search feature to make it easier for employees to access the information they need. At the same time, the CCi team can now efficiently customize content for clients by making extensive use of snippets and variables in MadCap Flare. We love working with MadCap, and we’ve seen such a huge improvement in workflow with Flare. It’s given us a sense of empowerment to achieve things we had struggled to imagine doing before. Because CCi delivers documentation and training materials in so many formats, the company’s content developers continue to seek ways to streamline the process of delivery. Recently, the team developed an application that enabled the writers to integrate both Microsoft® PowerPoint® and Adobe® Illustrator® into MadCap Flare.